A military expert said the move provides a systemic guarantee. The regulation, which takes effect on March 1, focuses on improving the combat readiness of the People's Liberation Army (PLA), the Xinhua News Agency reported on Monday. The regulation provides measures to rectify practices that are inconsistent with the requirements of actual combat. It also gives the criteria for identifying malpractices and discipline violations in military training, Xinhua reported. An expert at a Beijing-based PLA military academy who requested anonymity told the Global Times on Tuesday that "the supervision regulations is meant to guarantee the effective execution of the training regulation implemented last year." On January 1, 2018, the PLA started a trial implementation of a revised military training regulation which embodies the military thought of Xi. In the past, the mission and evaluation of military training were conducted by the same combat units in the PLA. 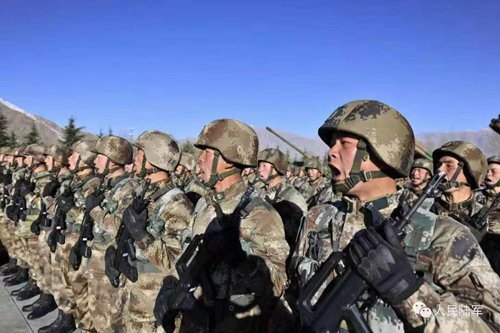 To make the military training and drill more objective and effective, the PLA needs units that are independent of combat troops, the anonymous expert said. "Although Chinese military forces have no chance to improve their combat capability in battle like the US and Russian militaries, since we have no war to fight, we can still strengthen combat capability through strict training and supervision. We should be prepared before a real war comes to us," according to the expert. The supervision regulation is expected to consolidate the strategic role of military training under the new circumstances, strengthen the management of military training, and deepen military training under combat conditions, Xinhua reported.